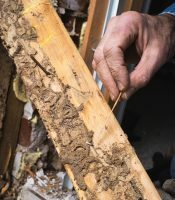 Kilter Termite and Pest Control has been providing homeowners in San Clemente, California, with superior termite treatment services since 1991. Since this time, we’ve earned an excellent reputation not only for our highly effective results, but also for providing service that is more convenient than our competitors’. What makes Kilter’s termite control services more convenient than other companies serving San Clemente, CA? We eschew traditional treatment methods, such as whole-house fumigation. Instead, we use the innovative and proven-effective KILGUARD System. This product is injected into infestation sites and is not harmful to families or pets. As a result, our customers can remain in their homes while treatment takes place, sparing them the hassle and added expense of finding other accommodations. Most importantly, KILGUARD completely eliminates termite infestations and effectively prevents them from returning. We will provide a free inspection along with an accurate estimate before you commit to using our services. We provide a two-year termite treatment warranty, so you can rest easy knowing termites will stay away. We offer an optional wood replacement service to help homeowners restore areas of their homes that have been damaged by termites. If you’d like to learn more about what makes Kilter Termite and Pest Control the best choice for termite treatment, contact us today. We are proud to serve homeowners in San Clemente, CA, and all surrounding communities.